The International Journal of Forecasting is the leading journal in its field. It is the official publication of the International Institute of Forecasters (IIF) and shares its aims and scope. More information about the IIF may be found at http://www.forecasters.org. 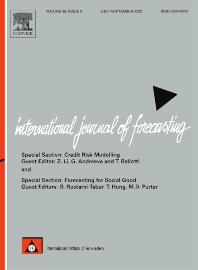 The International Journal of Forecasting publishes high quality refereed papers covering all aspects of forecasting. Its objective (and that of the IIF) is to unify the field, and to bridge the gap between theory and practice, making forecasting useful and relevant for decision and policy makers. The journal places strong emphasis on empirical studies, evaluation activities, implementation research and ways of improving the practice of forecasting. It is open to many points of view and encourages debate to find solutions for problems facing the field. Features of the IJF include research papers, research notes, discussion articles, book reviews, editorials and letters. Data and computer programs associated with articles published in the International Journal of Forecasting are provided as online supplements on ScienceDirect. To ensure fairness and objectivity, double-blind reviewing will be used. The IJF encourages replication studies, especially of highly cited papers. See Encouraging replication and reproducible research (an editorial published in 2010) for further information. A replication study that confirms that a published paper can be successfully replicated would normally be quite short (about a page is often sufficient to describe what calculations and comparisons have been done). Where a previously published paper has not been successfully replicated, more details are required to explain how the results differ from those previously published.